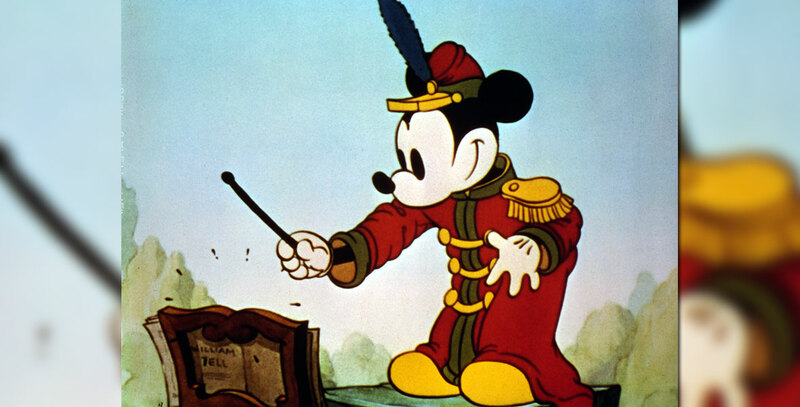 Band Concert, The (film) Mickey Mouse cartoon; the first one in color, released on February 23, 1935. From then on, with the exception of Mickey’s Service Station and Mickey’s Kangaroo, all the Disney cartoons would be in color. Directed by Wilfred Jackson. Mickey is a frustrated bandleader who must deal with obnoxious peanut vendor and flute player, Donald Duck, who tries to persuade the band to play “Turkey in the Straw,” and a cyclone before his concert of the “William Tell Overture” is completed. The cartoon was a major success, making Donald more popular than ever and was later included in Milestones for Mickey (1974). Conductor Arturo Toscanini called this cartoon his favorite.